www.americanpresstravelnews.com News.com – June 27th – Riding around the Lake Erie region of Chautauqua there are vineyards almost everywhere. To find out more about the business of grapes in this attractive area we visited The Cornell University Lake Erie Research Extension Laboratory. We learned that there are approximately 30,000 acres in the Lake Erie region of New York and Pennsylvania. 98.5% of these grapes are used for juice, jam and other fresh or fermented products. The Lake Erie Regional Grape Program consists of Extension Educators and research faculty/staff from Cornell University and Penn State University devoted to projects aimed at increasing yields, product quality, diversity and improvement of cultivars, efficiency of production, profitability and adoption of environmentally sound cultural and pest management strategies. To find out more take a look at their website: www.lergp.cce.cornell.edu/. 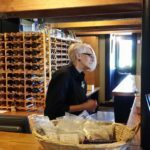 Our next stop was at the Johnson Estate Winery. 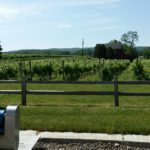 This is oldest estate winery in the New York State, established in 1961. The Johnson’s Estate is a Story of Three Generations, beginning in 1877 with an English orphan named Frederick Johnson. In 1908 Johnson purchased this home circa – 1822 with the adjoining farm along the banks of Freelings Creek, in Westfield, N.Y. There is a full history on the website. 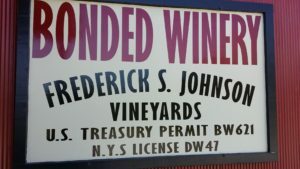 Today it is owned by Frederick Johnson Jr. with his wife Jennifer, former president of the Chautauqua – Lake Erie Wine Trail. 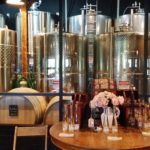 They completed a renovation of the tasting room in 2011 for the winery’s 50th anniversary celebration. This building has been beautifully renovated complementing the old with the new. They have a full side viewing window with the full size stainless steel tanks. appointment. Also, they have many summer events that a space can be reserved online. 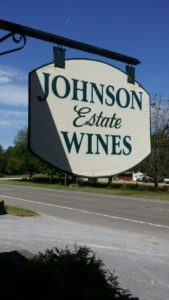 Check out their website: www.JohnsonWinery.com or call (716) 326-2191.